Make some homemade preserves in this two hour community class. Join Megan from FoodPreserving.Org and make a batch of sun-dried tomato chutney, mustard or pickled cauliflower. Then enjoy a cuppa and a slice of Megan’s homemade quiche (using mustard and preserves in the filling) for morning tea. Under the guidance of Megan you will learn the important skills of home food preservation in a social setting, mastering basic techniques and be inspired with new and exciting types of preserves and unique flavours. Monday classes are restricted to 6 participants so there is time for you to have one-on-one assistance during the classes as required. Monday classes are mainly demonstrations, with some hands-on preparation/cooking if you like to be involved. Community classes usually run for around 2 hours. Please arrive 10 minutes before the class starts. All equipment is provided – but make sure you wear suitable clothing, enclosed shoes, hair tied/pinned back and an apron (optional). If you have any food allergies, please notify us prior. 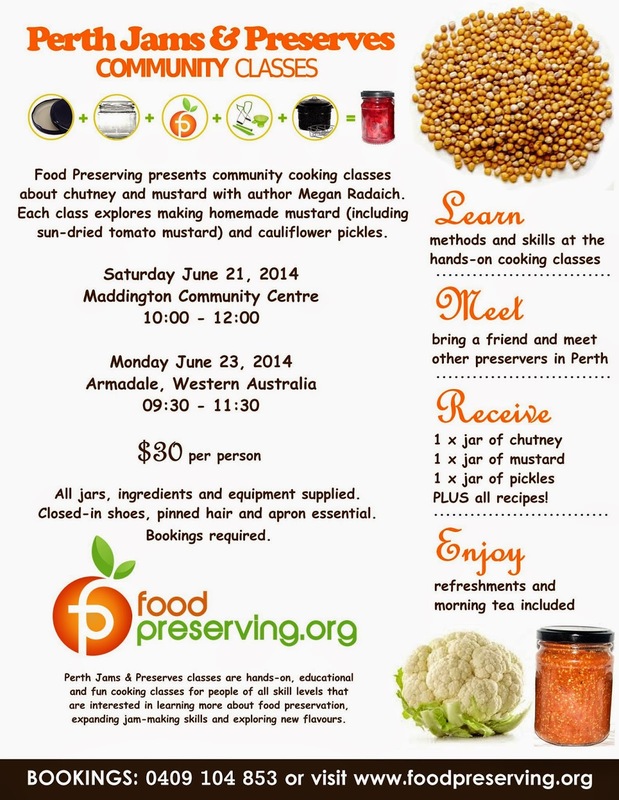 Monday classes are held in the Food Preserving kitchen (Armadale, Western Australia). Address is provided with confirmed bookings.